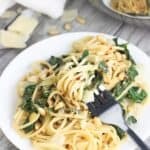 This Creamy Lemon Spinach One-Pot Pasta is a satisfying and simple weeknight meal that takes just 30 minutes to make! There’s no need to drain the pasta and it’s dairy-free. Heat olive oil in a large pot set over medium heat. Add diced onion and minced garlic and let cook until onions have begun to brown. Add chicken broth, 1 cup of lite coconut milk, salt, pepper, and spaghetti. Let mixture reach a boil, and then lower temperature to medium to medium-low heat. Cover and let cook until the spaghetti has absorbed nearly all of the liquid, stirring periodically. This took about 15 minutes for me. Stir in red pepper flakes, lemon juice, lemon zest, and spinach until everything is well-mixed and cook until the spinach has reduced and is tender. Before serving, stir in chopped basil and pine nuts. If you'd like an even creamier sauce, pour in an extra drizzle or two of lite coconut milk and toss to heat slightly and coat all of the spaghetti evenly. When reheating leftovers, I suggest adding an extra drizzle of coconut milk prior to heating to maintain the creaminess.